Three-Spot Gourami is a variety of Gourami type of fish that belongs to the Belontiidae family. This fish variety hails from southeastern Asia, and is also called as The Blue Gourami. This fish variety attains its name due to the location of two spots along both sides of its body. One spot is located in the middle part of the body, and the second spot is located at the beginning of its tail. The eye of the fish is considered the third spot. This fish variety is largely found in the Mekong basin in Cambodia, Thailand, Laos, and Vietnam, and Yunnan in the Southeastern parts of Asia. They inhabit swamps, marshes, canals, and lowland marshlands. Usually, these fish breeds prefer water conditions with the temperature ranging from 72 degree Fahrenheit to 82 degree Fahrenheit. The Three-Spot Gourami fish breed is a semi-violent variety of fish that has a maximum body length of six inches. They have a silvery blue colored body and the color may change considerably by their moods. This fish breed is considered Labyrinth Fish, which means that it will breathe from the air directly and it should have access to the aquarium surface. The finest way to distinguish between the female and male Three-Spot Gourami fish breed is through their dorsal fin. The male breed has an elongated and pointed dorsal fin, whereas the female breed has a shorter and circular dorsal fin. The Three-Spot Gourami fish breeds are omnivores and they are fed with both meaty foods and algae-based foods. In addition, they also fed with freeze-dehydrated bloodworms, brine shrimp and Tubifex. The Three-Spot Gourami fish breed will be accommodated with a mixture of tank companions that are of analogous size and nature. Male Three-Spot Gourami breeds are more aggressive and can be defensive with each other, which will turn out to be timid around each other. So, they should be kept in an aquarium with a minimum capacity of 20 gallons, arranged with an abundance of live plants, including driftwoods and rocks for shelter and hiding purposes. 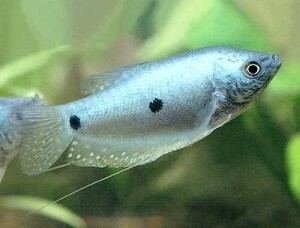 During the reproduction process, the body color of Three-Spot Gourami fish varieties changes to deeper blue shade. When they prepared to breed, the male breed constructs a bubble nest and then starts enticing the female fish by swimming backward and forward, raising his tail and flaring his fins. When these fish are developed in the aquarium, subsequent to spawning, the female fish ought to be shifted to a separate tank because the male fish may become hostile toward her. The female fish may lay a maximum of 800 eggs. The male fish will protect the eggs pending they hatch, and subsequent to hatching, the water in the aquarium should be changed frequently. The average lifespan of the Three-Spot Gourami fish breed ranges from 4 years to 8 years.